We got some Black Astralorp chicks from Tractor Supply for $.99 each. You can usually do this by waiting until near the end of their “chick days”. These birds are sometime two weeks old, which I consider a good thing as they have been fed by somebody else for a couple of weeks and you are likely to get birds with a higher chance of living. I have done this twice now, getting birds at a cheep price. The only downside is you basically have to take what they have in stock. I keep them in a brooder that is about 4′ square with a roof and 3 wood sides and one Plexiglas side. I take radiant foil insulation from Home Depot and line a cardboard box with it and cut a small opening in the side, kind of like an igloo. by having a larger number of chicks (35 in this case) and this place for them to go and huddle to get warm I am able to brood them with out electricity. Don’t believe you need heat lamps to successfully brood chicks. 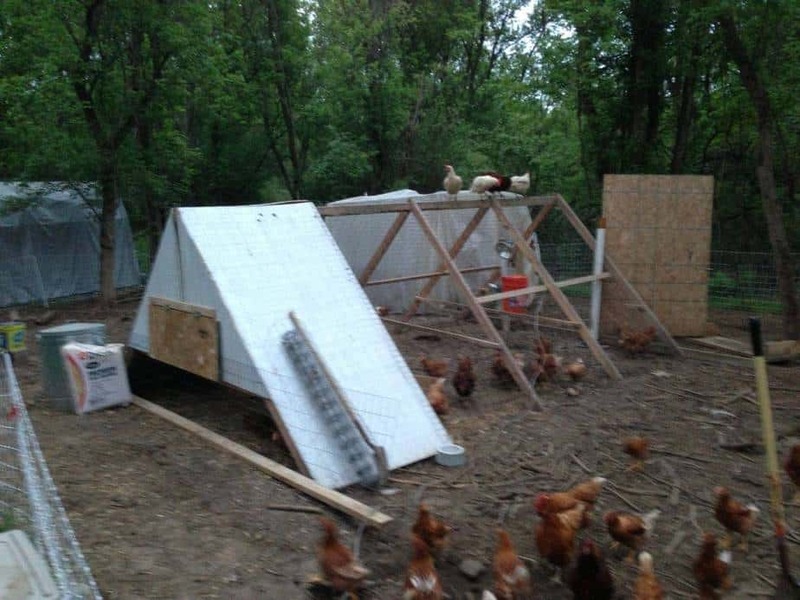 Now that they are about a month old I’m moved them to my first coop, an A-Frame 16′ long. The picture at the top is when I first build it, but as my flock got bigger it was too small. My plan is to use it for these birds to get some size on them and then introduce them to my existing flock. Below is a quick video. For whatever reason the hours of daylight, more specifically the lack there of, affect the number if eggs your hens will lay. That is why you get greatly reduced numbers of eggs in the winter time. For those of us that sell eggs to pay for the feed try to reduce this effect by adding supplemental light to the coop to simulate the longer days of summer. However you do not want the light on all night so many will put it, but that means you have to adjust it as the time the sun down goes down changes. I found a timer/dusk sensor combination in which it turns on at dusk and stays on for 2, 4, 6 or 8 hours. We have less than 10 hours of daylight here in S.E. Michigan in winter so I set it for 6 hours during the darkest months. For a light I just use a simple shop type light with an aluminium reflector behind it. I don’t see the one I have anymore at Amazon, but something like this is what I have. 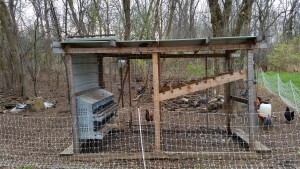 Below are pictures of my coop. Not a very pretty setup, but it will do until I can make it better. 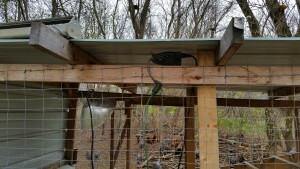 I’m planing on an upgrade and thinking about just mounting an exterior light inside the coop. Home Depot has a selection in the $5-$10 range. Since I have a home automation system in my house I can take advantage of this. There is a LED bulb in the $30 range that has an internal switch that can be controlled by my home system. The system I have has the feature of turning on at dusk and setting an off time, for example the security lights on the garage come on at dusk and go off at 11PM. This gives me the advantage of turning the light on a schedule from the central controller or turn it on or off from my smart phone.